So, you’ve just spent a lot of time and money designing and installing that in-situ environmental remediation system at your facility. You were assured that the system will remove contaminants from the soil, soil gas and/or groundwater but it will take a few years or more to achieve regulatory endpoints. At least the big headaches and costs have passed. Or have they? It’s tempting to exhale a bit once your remediation system is up and running. The construction crews have cleaned up, regulators have turned their attention elsewhere and your facility operations can get back to normal. Your operations and maintenance (O&M) budget has become a part of your annual planning. But just because things have quieted down, it doesn’t mean you should stop paying attention to the costs. Are you getting the most bang for your buck, especially over the long term? The tips offered below are based on over 30 years of designing, building and operating environmental remediation systems. While no two situations are the same, there are certainly commonalities that contribute to the success and efficiency of an O&M program. It is our hope that you will benefit from our experience and be able to deploy your O&M dollars as effectively as possible. Understand your regulatory end-points before you commit to your remedy. You’ve spent a lot of time and money in the assessment stage trying to quantify the extent and magnitude of your subsurface contamination. You now want to know how much this will cost to clean up. Before you think remediation costs however, it would be advisable to engage an environmental consultant who can also assess the human and ecological risks associated with doing less or no remediation. In many cases and in many jurisdictions, you may have options to scale back your remedial response based on the risk to humans and the environment. Why design and operate a remediation system to attain generic cleanup standards when you don’t need to? Even if you already have an active remediation system, its not too late to evaluate risk-based end-points. You may be closer to the end than you think. Think O&M costs in the system design phase. Most remediation systems are designed for the full extent of contamination on day one. System designers don’t like to fall short on the equipment specifications, so many designs also include an additional performance buffer. That seems right for the first few months of your O&M program when the contaminant mass is at its most enriched and readily accessible state. However, contaminant mass removal rates tend to drop off significantly over the early phases of the remediation program and then level off into a steady long-term phase. From fairly early on, the system is essentially over-designed. Each month, more O&M dollars are spent for less mass removed. During the design phase of your remediation project, ask for projections of anticipated O&M costs for both the “initial-mass” removal phase as well as an “average mass” removal phase. Also ask for expenditures along the life-cycle of your projected project. The long-term O&M costs are typically significant enough to factor into your initial design decisions. Another way to save O&M dollars at the design stage is to make system-checks more efficient. For example, an operator that has to visit and open each recovery vault or wellhead just to collect the days data will remain on the clock much longer than one who has all the valves and monitoring ports in a centralized location. Not only can significant cost savings be realized by reducing the operator’s time on-site, the operator will be in a much better position to collect performance data accurately and make the best optimization adjustments. Do you need a hammer or a Q-tip, or both? As noted above, most remediation systems are designed with “day one” in mind. The big “hammer” approach may have been necessary during the early stages, but to a lesser and lesser extent over time. O&M dollars are increasingly spent on system upkeep and utility costs rather than toward moving the remediation project forward. For various reasons, there seems to be a tendency to stick with an as-designed remedial approach long after its cost-effective life has past. Be sure to have your consultant evaluate the cost-benefits of modifying the remedial approach in the later stages of the remedial program. This “adaptive site management” approach can often identify a reduced-effort tactic (Q-Tip) that can make a real difference in your annual costs. Are you paying for a system operator or a meter reader? All in-situ remediation systems require some degree of human operations and maintenance. The key is to hire O&M services that have the knowledge to maximize remedial progress. An experienced system operator will measure and manage key performance metrics in each particular system to maximize the effectiveness of the remedial program during each and every site visit. A great operator has the experience to anticipate system “upsets” which reduce unplanned downtime and costly repairs. They also understand the difference between “preventative” maintenance and “reactive” maintenance. We have seen that the right operator can single-handedly expedite the overall remedial timeframe and significantly reduce O&M expenditures. If you are getting a lot of surprise invoices associated with unforeseen repairs or your system always seems to be “down” due to malfunctions, it may be that your system operator is really just a meter reader. The long-term costs of the low-cost providers. Over a long haul, owners understandably seek to reduce their annual O&M costs through a competitive bid process. O&M responsibilities can change hands many times over the years; each time a successive operator picks up where the last one left off. Tolerance for underperforming equipment and band-aide maintenance becomes the norm. While the unit rate of the latest operator is incrementally lower than their predecessor, the progress made on the overall remedial program continues to diminish. Further, there is an inherent lack of motivation to be efficient and get the remediation project done. The low-cost provider simply doesn’t want the work to end. We understand the rationale behind lowering costs. Such savings can be used elsewhere in your organization for greater benefit. For that, we offer the next Tip. Understand where your O&M dollars are going? It is important to recognize if your O&M costs are associated with equipment and consumables or if they are the result of personnel, or both. Are you spending a lot of money on electricity keeping your pumps and treatment devices running while little to no contaminant mass is in the process stream? Are you spending a lot of personnel time collecting a mountain of data that never changes? Are your processes constantly failing from organic or inorganic fouling that causes system downtime and increased maintenance events? There are solutions to all of these common situations. By first understanding the root cause of your O&M expenditures, you will be in a better position to potentially make a big difference in your annual budget. Renewable verses consumable treatment devices – what’s the difference. Treatment devices can be classified in many ways. For this tip, we are going to talk about renewable verses consumable treatment devices. A renewable technology is a device that does not diminish treatment capacity over time regardless of the amount of contaminant mass it has treated (catalytic/thermal oxidizers, skimmer pumps, soil vapor extraction systems, etc.). A consumable technology is one that diminishes capacity as treatment occurs (granular activated carbon (GAC), sorbents, bag filters, etc.). The application of renewable and consumable technologies is often dependent upon the amount of contaminant mass and the rate at which it is being treated. Generally speaking, the more abundant and robust the contaminant mass, the more cost efficient it is to use renewable technologies. Conversely, low mass situations can be better suited for consumable remedies. 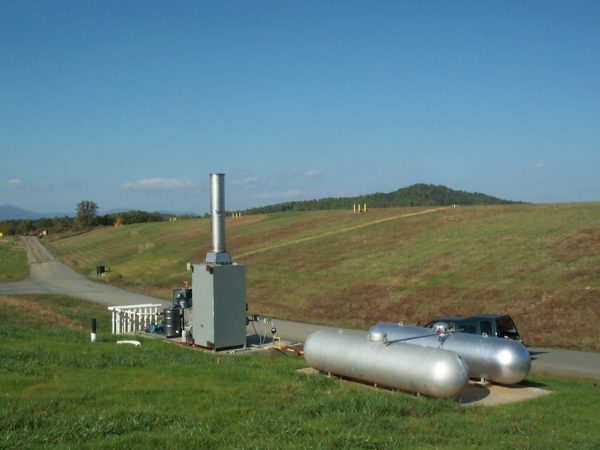 For example, a thermal or catalytic oxidizer is frequently a good choice for a soil vapor extraction system at the early stages of a remediation program. Abundant mass is removed requiring off-gas treatment prior to being discharged to the atmosphere. Using GAC at this early stage would be cost prohibitive as the abundant mass would quickly render the carbon “spent”; requiring frequent and costly change-outs. As the mass reduces over time, more O&M dollars are spent on the oxidizer (capital/lease costs, utility costs) than would be spent substituting for GAC. This same concept of “dollars spent per mass removed” can apply to other technologies. The key is to know when it is cost efficient to switch from a renewable to consumable process. A good system operator can track mass removal rates verses treatment cost and recommend the proper time to switch treatment devices. It is important to have your consultant pay attention to such details. Consider telemetry and remote monitoring. Modern communication technology is cheap. Sending a human to randomly check on a system is not. Design or add telemetry systems into your remediation system that can be accessed via remote computer, can “call out” when performance metrics fall out of range and provide some data on system faults. With even the simplest telemetry systems, the frequency of O&M visits can be dramatically reduced. Further, technicians can be more informed of system upsets and mobilize prepared to conduct the necessary maintenance. Which brings us to “down-time”. When a system is “found down” during a routine site visit, the technician is often unprepared or doesn’t have time left in the day to conduct the necessary repairs. Thus, another visit on a later date is scheduled. Added cost and down time! Also, without telemetry, we often don’t know if the system went down a day ago or a week ago. Down time can easily add up to months or even years of prolonged operation and expenditures. Note that we recommended simple telemetry systems. Which leads us to the next tip. Bells and whistles? Being able to open and close valves from a hundred miles away is a necessary function for some industries (pipelines, chemical plants, etc.). Being able to access real-time data to your office computer can also have benefits. There are times when spending more to have such functionality is essential (e.g., critical safeguard, real-time discharge compliance, etc.). We don’t consider such critical and essential design features to fall into the bells and whistles category. Often, we’ve seen design features that only marginally add to the overall necessity of the system but add significant cost. Some can actually hamper the O&M process by becoming a maintenance item on their own. Regardless if you are in the design stage or late in the overall remediation program, we recommend that you evaluate if the extra bells and whistles are truly necessary to attain your remediation goals. Conduct an Annual Optimization Review. Very few in-situ systems operate exactly as designed. Initial system designs are based on inherently limited data and an educated prediction of performance. The most accurate performance data becomes available only after the system has been activated. Also, operational parameters and site conditions can change over time. For example, groundwater elevations rise and fall, impermeable surfaces can be removed or upstream stormwater paths can be redirected. These and many other factors can affect how the remediation system performs. It is important to consider your remediation program as an iterative process, so routinely evaluate the status of your remediation program. Instead of spending the same O&M dollars year after year to keep the same system “running”, recognize that circumstances have likely changed. We recommend that you conduct annual “optimization reviews” with your system operator. Many of the tips listed above can be evaluated during this review. Not only will you discover considerable savings, you will also be confident that are getting the most bang for your buck. Brownfield Science & Technology, Inc. (BSTI) is an earth sciences company specializing in environmental assessment, remediation and consulting services for public and private clients. We use science, human talent and state-of-the-art tools to guide our clients through environmental challenges. If you would benefit from deep expertise, responsiveness and been-there-done-that capability, then we may be the right firm for you.